Everything you need to know about choosing baby’s first bed (and why you should avoid round cribs). If you’re expecting or have a new baby, you know how important a crib is. It needs to be safe and comfortable- and it needs to provide you with peace of mind, and provide your baby with a good night’s sleep. Should you buy a toddler rail? How should you choose a crib? The Kalani 4-in-1 crib is made of pine wood. It converts to a toddler bed, daybed, and full-size bed, but you’ll need to purchase the conversion kits separately. It’s worth it, though: In addition to preventing falls, toddler bed rails offer little ones a sense of security and often ease the transition from crib to bed. With its sleigh-liketop but bulging sides, the Kalani crib offers a unique blend of classic and modern.It also offers three mattress positions and comes in seven colors: cherry, chestnut, ebony, espresso, gray, honey oak, and white. Also, the Kalani is phthalate-safe and screened for hundreds of VOCs and thousands of chemicals. While this isn’t a must and cribs are safe without it, it’s still nice to know. Is it for you? If you’re looking for a sturdy, popular, modern classic, the Kalani is the crib for you. The Union 2-in-1 Convertible Crib converts from crib to toddler-size daybed, and offers four mattress heights. Made of pine wood, the Union 2-in-1 has a phthalate-safe finish and meets international and US safety standards. The Union 2-in-1 is a classic model, with its square sides reflecting an elegant simplicity. It comes in sunshine, lagoon, espresso, gray, and white. It’s worth noting that this crib doesn’t have an option for a toddler rail. Is it for you? If you’re looking for a simple, no-fuss classic, the Union 2-in-1 is probably the crib for you. The Da Vinci Jenny Lind is a classic crib with four mattress positions, and converts to both a toddler bed and a daybed (but you’ll need a kit for both conversions). Its wheels are optional and can be removed, and its slim profile makes it ideal for smaller spaces. One of the best parts about the Da Vinci Jenny Lind is that it comes in nine different colors: cherry, coral, ebony, emerald, lagoon, navy, slate, white, and fog gray. Made of pine wood, this crib meets international and US CPSC safety standards. Like the Kalani, the Da Vinci Jenny Lind is phthalate-safe and screened for hundreds of VOCs and thousands of chemicals. Is it for you? If you’re looking for a slimmer model with wheels and unique color options, this is the crib for you. The Stork Craft Valentia is a four-in-one convertible crib, offering options to convert to a toddler bed, daybed, and full-size twin bed. Conversion to a toddler bed does not require an additional kit; however, conversion to a full-size bed requires an additional set of rails. The Stork Craft Valentia also offers three mattress positions, and on Amazon, is eligible for free replacement parts for life. With an appearance slightly resembling that of a graceful harp, the Stork Craft Valentia is a true beauty. It’s worth noting, however, that the ends of the bed are solid. This doesn’t really matter, but if you don’t like the idea of a solid side on a crib, you might want to skip this one. The Stork Craft Valentia comes in five colors: black, espresso, cherry, white, and gray. Is it for you? If you’re looking for a modern classic that will look great whether you child is a toddler or teen, this crib will be a great buy. With its modern style, Babyletto’s Hudson 3-in-1 Convertible Crib offers parents a change from the standard crib styles. With shorter legs and a height of just 35 inches (most are between 42 and 45 inches), this crib is perfect for shorter parents and those who prefer to bend rather than stretch. Like the Kalani and Da Vinci Jenny Lind cribs, the Babyletto Hudson is phthalate-safe and underwent testing for both VOCs and harmful chemicals. This crib transfers easily to both toddler bed and daybed, and the conversion kit is included. Is it for you? Babyletto’s Hudson is perfect for parents who are shorter and have a modern sense of style. The Graco Benton Convertible Crib converts to toddler bed, daybed, and full-size bed.However, you’ll need to purchase a bed frame for the larger beds. This crib not only meets federal safety regulations, it also adheres to the Juvenile Products Manufacturers Association (JPMA) standards. With its straight sides yet rounded top, it’s easy to see how the Graco Benton will make a stately full-size bed for older children. Meanwhile, the crib offers three mattress levels and comes in five colors: pebble gray, whitewash, white, espresso, and driftwood. It’s worth noting that the Graco Benton’s full-size bed has two options: headboard only, or headboard and footboard. Is it for you? If you want a gorgeous crib and the security adherence to an extra set of standards brings, this is the crib for you. A modern take on a classic, this simple crib converts into a toddler bed and a daybed. Dream on Me offers an option for a toddler rail, which needs to be purchased separately. The Dream on Me crib offers stationary locking wheels, double hooded for safety. Made of cherry wood, this crib comes in five colors: white, black, cherry, espresso, and natural. The downside? It has a relatively short warranty of just three months. Is it for you? The Dream on Me is perfect for parents who love a minimalist look and want to keep the crib budget to double digits. Want some more of the technical information? In recent years, experts have begun differentiating between SIDS (Sudden Infant Death Syndrome) and SUID (Sudden Unexpected Infant Death). SUID is a catch-all term which includes SIDS – but also includes accidents such as strangulation or suffocation. Safe sleeping habits are an integral part of preventing SUID, and over the years, the safety guidelines for cribs have changed to reflect that. Today, a safe crib has: a tight-fitting mattress, slats less than 2.38 inches (6 centimeters) apart, no scrollwork or finials, and a height-adjustable mattress. In 2010, the US Consumer Product Safety Commission banned drop-side cribs as well. Before you purchase a crib (or mattress), make sure it meets safety standards. If you can, purchase the crib and mattress at the same time. While there are round cribs, they don’t fall under (US) federal crib safety guidelines. Instead, they’re regulated as playpens. These are okay for short naps, but should be avoided if possible for nighttime sleep. It’s also important not to use crib bumpers, pillows, heavy blankets, sleep positioners, or a “wedge,” since these increase the risk of suffocation. If you can avoid it, don’t use a mobile, either (and if you do use a mobile, take it down when your baby starts to reach for it). To keep your baby cozy, use a sleep sack or a blanket tucked tightly under the mattress and covering only up to your baby’s chest. Don’t place your child’s crib next to a window or any hanging threads. Also, don’t place it under a bookshelf or picture frame. Unfortunately, safe cribs aren’t known for being superbly comfortable. Babies need a firm mattress, and nothing soft should be in the crib. When it comes to parents’ comfort, though, the various cribs have a lot to offer: Some have single-drop gates, which allow you to easily access your baby without buying a drop-side crib. Others have “teething rails” – a plastic covering for the tops of the crib’s sides, so drool doesn’t get on the wood (make sure the plastic isn’t cracked or chipped, though). All cribs should have a height-adjustable mattress, which you can lower as your baby grows – but which will allow you easier access to your tiny newborn. If you choose a model with wheels, choose one with locking wheels, so you can safely park the crib where you want it to be. Like safety, quality is of utmost importance when choosing a crib. Though you can find good cribs for as low as $79, you can’t afford to have the crib fall apart on you – or your baby – after only a week or so. Choose a crib which is sturdy. The joints shouldn’t move when you wiggle the crib from side to side, and you should be able to press down on the mattress (or out on one of the sides) without feeling anything move. After you purchase a crib, it’s a good idea to tighten its screws every few months. Also make sure the crib is made of materials which will last. Wood is the best choice, as well as the most popular material. Just be sure the wood finish isn’t splintering or peeling. It’s best to buy a crib with a warranty of at least one year. Every crib should have three mattress levels: birth to three months, three to six months, and six months to three years. The reason for this simple: At around age three months, babies start rolling over; at age six months, they often begin to sit up on their own. The mattress should be low enough that your baby won’t tumble out when they turn over or sit. But until babies gain mobility, there’s no reason for parents to bend nearly double to place babies in a deep crib. It’s important to note the cradles and playpens usually don’t offer an option to change the mattress’ height. Also, cradles should only be used for the first three or so months of a baby’s life. Playpens are not intended for use at night. Many parents, especially those who don’t want more than one child, or who want generous spaces between children, opt to buy a crib which converts to a toddler bed. 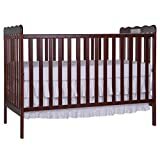 Some of these models have an option to buy a “kit” (longer sides and slats) which allows the crib to convert into a daybed or twin bed as well. Some convertible cribs also convert into chairs. It’s important to note that convertible cribs are not necessarily more expensive than non-convertible cribs. Convertible cribs are popular, both because parents love options and because buying a crib and toddler bed separately isn’t worth the money, unless you have a baby and a toddler at the same time and no space for a larger bed. That said, many parents love the smaller beds, which preserve the “baby” feeling a while longer. And toddlers love them, too: The transfer from crib to “big kid” bed is much easier when the new bed is smaller, has rails, and highly resembles the child’s crib. Obviously, then, turning the crib itself into a toddler bed will ease the transition for many, if not most, children. Yes. It doesn’t have to be the rail that comes with your crib, but you will need a toddler rail eventually. Your crib’s conversion kit provides you with the ability to attach the rail to the bed’s frame, whereas if you bought a rail separately, it would fit under the mattress. The conversion kit is therefore safer (because it screws into the frame). In addition, it looks nicer and the familiar-looking rail in front of his face will help your child feel more secure. Cribs, even convertible cribs, are not full-size beds. If the crib you chose converts to a full-size bed, you’ll need to buy a converter kit. Should you buy it now? That depends. If you buy the converter kit now, you’re guaranteed to have a nice-looking full-size bed later on. No one can promise that in seven years, the company will still be selling converter kits for the crib modelor color you bought. For that matter, no one can guarantee that any of these companies will still be around. On the other hand, it isn’t urgent. Even if the company went bankrupt, even if there is no one selling the rails second-hand, all you’d need to do take two standard-size bed rails and screw them in. It might not look gorgeous – but if you cover it with the comforter, you’ll be fine. Personally, I would buy the converter kit. 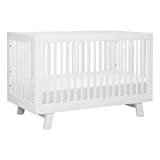 It’s a purchase for the future, and to me, it’s part of the reason I would choose that crib.Again, though, it’s not mandatory, and not as important as buying the crib’s toddler rail. In short: If you have to choose between full-size bed rails and a toddler rail, choose the toddler rail. The most important part of choosing a crib is checking to make sure it meets safety standards, and making sure it’s solid. The best options are standard-size cribs, which will allow you to easily purchase a replacement mattress later on. Crib mattresses can become soft, moldy, or torn over the years, whereas the cribs themselves can last for much longer (provided they still meet up-to-date safety standards). Round cribs may be beautiful, but it will be harder to buy a replacement mattress, and even more difficult to find tight-fitting sheets. And as mentioned before, these cribs are not regulated as cribs – they’re regulated as playpens. You’ll want to choose a crib that isn’t too tall or short for you or your partner, and has at least three height settings for the mattress. It’s also important to decide if you want your crib to have wheels. Many cribs are part of a nursery set. These can be bought with or without the rest of the set, which may (but not necessarily) include a dresser, changing table, closet, bookshelf, and rocking chair. Choosing a crib is a big deal – but it doesn’t have to be difficult. Unlike the difficulties inherent in properly using a car seat, use of a crib is simple: It stands by the wall, and it shouldn’t have anything soft. The only important criteria for the crib itself is whether it meets safety standards. Fortunately, most of the cribs sold today do. Choose a safe model which suits your needs and your taste, take a deep breath, and buy it. Do you own one of these models? Have any questions that weren’t answered? Let us know in the comments.